(02-07-2013, 06:30 PM)purplepennyhunter Wrote: I almost died of shock, well actually I stood there like a nutter absolutely speechless when I got the purpular coin in my change today at the bakery!! Does that make you a "PurpleTwoDollarHunter" instead now? I hunt all things purple. 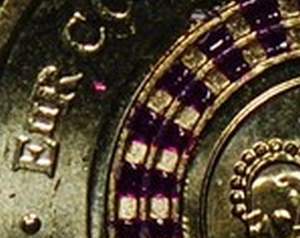 This coin is very cool and it's a bonus that it's purple. It has everyone talking and has my kids interested and that's all we want to spark new collecting interests. Saw my first one in Qld today. Was at the bank (NAB at Coolum) and heard the teller mention the purple $2 to a customer 2 in front of me so I asked when I got up there and they said they did have a few bags. Two tellers pulled 1 bag each out and they were full of new 2013 $2 coins but one only had 1 purple coin in it and the other had about 4 so I asked for the second. All other 2013 coins were the standard. No problems, the teller then tore the bag open, poured the coins over the counter and slid them over the counter as she counted them with her fingers all over them. So I then asked for the unopened bag with 1 coin in it instead. Managed to also get another bag that had 2 purples in it. (03-07-2013, 04:45 PM)Steveqld Wrote: ...the teller then tore the bag open, poured the coins over the counter and slid them over the counter as she counted them with her fingers all over them. We really need a concerted effort to educate them I reckon. I always ask them not to flick notes, for example. If tellers become too aware of what coins and notes to look out for then you may notice that your supply dries up pretty quick. Im always careful to tell them just enough without empowering them. (04-07-2013, 06:15 PM)enworb Wrote: If tellers become too aware of what coins and notes to look out for then you may notice that your supply dries up pretty quick. Im always careful to tell them just enough without empowering them. I have some of these that have been pulled out of security bags and they are already showing signs of rogue paint. Some of the purple stripes are chipped and under loupe you can see the paint flecks loose in the 2x2. Quote: Heh, give it a month or three, and it will be.